Graham Berry having come across the grave of General Henry Karslake in the All Saints' graveyard, then found this BBC article on the web from a "Making History" radio programme. Derbyshire bell-ringer Sally Bramson submitted this query after a visit to a Somerset country church in the town of Wrington, between Bristol and Weston-super-Mare. In the churchyard she noticed an interesting inscription on a family memorial. One of the names on it was Lieutenant-General Sir Henry Karslake KGB, KCSI, who was described as the 'Hero of the Quetta Earthquake 1935.' He was born in 1879 and died in 1942. Sally wanted to find out more about the Quetta earthquake and what Henry Karslake had done to make him a hero. The city of Quetta is in Pakistan, 50 miles from the Afghan border. Before the partition of the Indian sub-continent in 1947 it was in India on what was the North-West Frontier, the mountainous area on the border with Afghanistan. Quetta has long been a military settlement. The very word Quetta (pronounced 'kwatah') is a version of kwatkot, a Pashto word meaning 'fort'. In the 19th century it was one in a long line of frontier posts, coming under British control in 1876 at the end of the second Afghan War. From then on it became a garrison town, eventually becoming the British headquarters in the Baluchistan region. had connections with the college and Montgomery was an instructor there in the mid- 1930s. The commandant and Baluchistan district officer there at the time was none other than the man remembered in Wrington churchyard: Lieutenant-General Sir Henry Karslake. Dr Peter Boyden of the National Army Museum describes Henry Karslake as a frontier specialist. His peak years in high command coincided with the inter-war period. A Royal Artilleryman, he had been an officer in the First World War. After the war he served in India, first as a brigadier in the Western Command. This was followed by two years as an aide-de-camp to King George V before he went back to India as a frontier staff officer. The posting as commandant at Quetta came when he was in his late fifties and was intended to be the last big army job of his career. 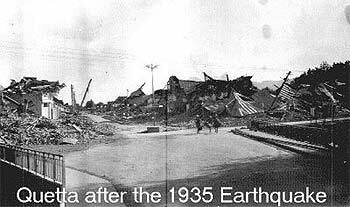 Karslake's most testing time came in Quetta when, in 1935, there was an enormous and terrible earthquake, at just after 3am on the night of 31 May. The earthquake devastated Quetta, killing at least 20,000 people. It was one of the worst natural disasters of the 20th century. Although the earthquake destroyed Quetta, the military cantonment and the Military Staff College were left standing. While some of the soldiers were killed, most of the 12,000 troops were on the spot to take part in rescue and relief work. Within three hours of the earthquake, Karslake had divided up the devastated area, allocated troops to each section and deployed them to start their work. They did everything possible: providing rescue, moving in supplies, keeping law and order, running postal and medical services and setting up a refugee camp on the racecourse. It was one of the quickest and most efficient disaster operations that had ever been implemented. The credit for organising the army effort was largely due to Henry Karslake. The soldiers worked in dreadful conditions with epidemic disease a constant threat. For Karslake it was his finest hour. He retired a year later but was briefly recalled to help with the evacuation of troops from Dunkirk in 1940, where he was the General Officer Commanding British troops in France immediately after the evacuation. He died two years later.